OBERSTEIN, GERMANY - Rashed wandered aimlessly in the dark, autumn leaves and twigs crunching under him with each step. 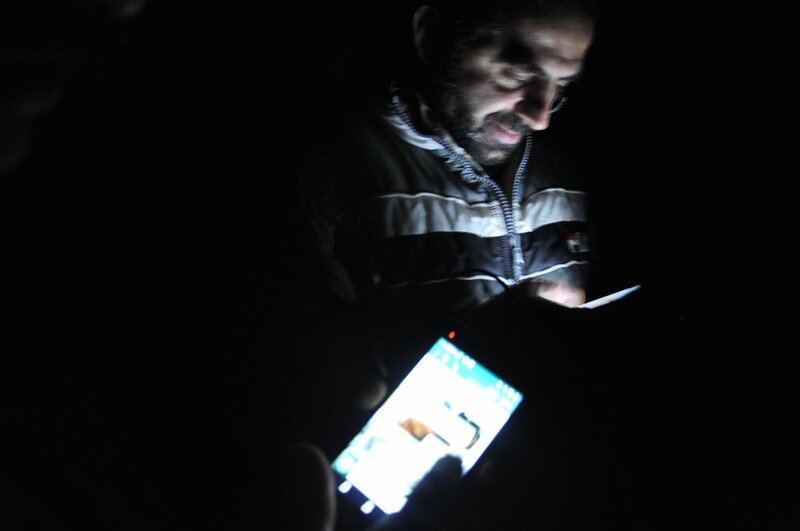 Apart from the light from his Samsung, the scene around him was pitch black. “I just need to get signal so they can send me a recording of Lulu’s voice,” he said, hopeful but frustrated. Lulu is his beloved two-year old niece – the one who almost convinced him to stay in Istanbul when he squeezed her goodbye. It was the last time they touched before he left his family behind to embark on the harrowing three-week journey to Germany. “‘Don’t go, don’t go, please don’t go,’ she kept crying,” he recalled. Rashed’s never been married and has no kids of his own. Lulu is his “soul” – the most important thing in his life. It was late October, and, along with Ahmed and some other friends from the beloved Syrian sweets institution Salloura where they all had worked together, Rashed was at a processing camp for refugees for about two months. They were staying in what looked like a cluster of dorm buildings, tucked away near a tiny village in southwest Germany. The camp, a former military dormitory, was surrounded by endless forest. In late fall, the trees were almost bare, their leaves crisping up and drifting to the ground. It had been three months since Rashed last saw Lulu, his brothers and his mom. It was the longest and farthest Rashed had ever been from his family – and they are separated still. It’s torture, he said. You could see it in his tired eyes, in his hands when he rolled his cigarettes. It was also one of the longest breaks he had taken from working since he was 12 years old. In Aleppo, the culinary capital where he’s from, it’s not uncommon for children and teens to adopt a trade, and Rashed tried a few. He became a tailor and then worked in construction. Eventually, he started making sweets. When he was 22, he strutted into the most prominent of Aleppo’s 13 Salloura branches. He wanted to become part of a name that was revered like a national treasure, a name that became synonymous not only with some of Syria’s best dessert, but with home. “I remember when he first came through the door of the shop, with his long hair obsessively combed…he was so full of himself,” Ahmed laughed, remembering the day he met his best friend nearly 12 years ago. Now he was sitting next to Rashed in a small shed tucked away in the sleepy German woods, hoping for a strong enough phone signal to talk to his wife and kids. “I was totally full of myself,” Rashed admitted, almost proudly. His hair wasn’t long anymore. At the camp, he’d begun tucking it under a royal blue baseball cap. But he still exuded a youthful charm. And Ahmed still made fun of him every chance he got. The best friends have shared a lot over the past decade. But now they share an unspeakable heartbreak: a five-country odyssey from their homeland to build a better life for themselves and their families, even if that very odyssey has taken them away from their families. When the pair met 12 years ago, Ahmed had already been working at Salloura for more than a decade – since he was 14. He split his time between two stores: one in the neighborhood of Azizziyyeh, owned by his main boss, As’ad Salloura, and the other in Khaldiyyeh, owned by As’ad’s brother. Every day he’d start at 9 a.m. and then switch stores at 5 p.m., working until midnight. At first, Rashed just worked at Khaldiyyeh in the evenings with Ahmed. “From then on, every day, Rashed would join me at As’ad’s store at 9 in the morning, and then at 5 we’d take my car to the other shop,” working side by side 15 hours every day, Ahmed said. They’d make sweets in the morning: spreading cheese over trays of crispy shredded dough for knafeh or layering paper-thin sheets of phyllo for baklava. In the afternoon and evening, they’d share stories with customers, getting to know them like their own relatives. They kept it up for over a decade, until 2013, well after their bosses fled Syria, well after Aleppo had devolved into a battlefield. But it was only a matter of time until one of them would get caught in the crossfire. The street had three snipers: to the right, to the left and straight ahead. He had to cross it most days, running zigzag to avoid getting shot. One Friday in late 2013 was especially bloody. “A guy who was visiting the store told me there were 15 people dead in the street,” and still, Rashed decided to cross. “I promised my family I’d bring home dessert,” he said. “I started running…left, right, left, right, left, right, all the way to the first checkpoint protected by the Free Syrian Army,” and he ducked behind some buses erected vertically to shield people from the snipers. Rashed later found out he was lucky to be alive – the bullet pierced through his back and into his gut. After two surgeries and months of recovery, he knew he had to leave. He gathered his brothers and sister-in-law, his baby niece, Lulu, and his mom. They took the bus across the border with Turkey and then continued for 24 hours until they reached Istanbul. Back then, crossing into Turkey wasn’t as much of a feat as it is now. The Turkish government kept a relatively open door to refugees on its southern border. By the time they reached Istanbul, with no phone or any of his old contacts, Rashed lost touch with Ahmed and his other Salloura friends. “I told Rashed he had to come back and work with me,” Ahmed said. By the evening, there they were again, side by side, just like they had been for a decade in Aleppo. Back then, they had no idea Istanbul wasn’t their final destination. And it’s hard to believe that it wasn’t. Rashed and Ahmed were managing a huge influx of customers. They were busier than ever, the kind of business they always dreamed of. But life in Istanbul wasn’t easy. It was louder, more expensive, less warm, less home. One steamy Sunday night in July, a crush of people made their way through the Salloura store in Istanbul. “For the love of god!” Rashed yelped over the half-dozen voices calling out orders. His bright green polo with “Salloura” branded on the top left soaked through as he frantically scooped globs of Salloura’s famous clotted cream (ishta) ice cream into white ceramic bowls. But even while he howled in frustration, his cheeks sagging from exhaustion, Rashed kept up his effortless charm. It’s hard to replicate the historic magic of an institution like Salloura, especially when you’re in a new place and working in subpar conditions: a small, overworked staff, ingredients that don’t taste quite like they did back home, the heavy bureaucracy of a country that isn’t one’s own. Add to that the weight on Rashed’s shoulders: in Istanbul he was the main breadwinner of a family of seven – his brothers were all struggling to find decent work for decent pay as Syrian refugees in Turkey. Salloura offered him the best salary he could get as a Syrian refugee in Istanbul; even if he wanted to leave the business, he couldn’t justify the pay cut when his family needed the money most. So he worked 15 hours a day like he did in Aleppo, and as the store in Istanbul became more popular, he even worked 20 hours straight. Still, two-year-old Lulu would resist sleep until her uncle came home. But by mid-summer, some nights were so busy at the restaurant he’d have to sleep over. Lulu would go days without seeing him. And in a way, Rashed didn’t blame her – he was kind of mad at himself, too, for falling back into the Salloura trap that had already claimed a decade of his life in Aleppo. In the year he worked as a tailor in Turkey – back when there was no Salloura in Istanbul – Rashed had weekends off and kept normal hours, an unfamiliar feeling for a man who had worked nearly every day since he was 12 years old. Yes, Rashed was proud of the work he had done at Salloura, of being affiliated with such an institution and of being part of rebuilding it in Istanbul. But he also had darker memories of working at the shop in Aleppo. “I’d gotten to a point where I hated this industry, I hated sweets, I hated the customers,” he said with a twinge of regret. “[Working at Salloura] distanced me from the people I love…I had a fiancée of four years, but we broke it off because I had no time to give her.” His niece, Lulu, means more to him than any lost love. Having no time to give her was breaking his heart. Leaving Istanbul for the unknown of Germany wasn’t an easy decision to make, but Rashed knew he had to find a better life for his family, in a country where Lulu can go to school, where she can make something of herself. He hoped she would someday understand. One night last fall, not long after we got back from Germany to visit Rashed and Ahmed, we went to his family’s tiny two-room apartment in Istanbul. We met Lulu, beautiful and brilliant. The tiny toddler had a halo of curls and milky baby skin. Her appetite for learning new words was remarkable. “Pink!” she’d shout in English, pointing to a pink toy tea cup. “Blue!” for the saucer. She recorded messages to her uncle into our audio equipment. We met his mother, who was stirring barely bubbling yogurt in a big pot. She was making a dish she calls ermen (also known as shakriyyeh), poached chicken (or more traditionally, lamb – too expensive for the family to indulge in right then) stewed in a smooth sauce of hot yogurt, served with a side of freekeh – roasted cracked wheat, nutty with flavor. She looked through the photos we took of her son in Germany. She couldn’t get over how old he looked, how tired the journey and all the responsibility to bring them over had left him. His younger brothers, Maher and Yasser, wanted to reach Europe but didn’t have the money. And now with a new, restrictive EU deal and closed borders, they’re not sure they’ll ever make it. Until then, they would have to rely on Rashed’s voice-notes from a whole new world – a kind of promised land they only know through movies. They recorded notes back – some heartfelt, most humorous. “Hammoudeh,” Yasser repeated Rashed’s nickname a dozen times over into the phone. “Where you at?” Maher chimed in, over and over. Lulu patted her mother’s stomach, pregnant with another girl. We gathered around a small table in their lone communal room to eat. The shakriyyeh is perfect – the yogurt’s not too thick, the chicken is just right. We regaled them with stories from Rashed’s new life in Germany. We told them how all the kids – and women – loved him. We told them that he still fastidiously gelled his hair – or hid it under his baseball cap if it wasn’t perfect – that he thought about them all constantly. This piece originally published on Culinary Backstreets and The Groundtruth Project on April 5, 2016.